Camille of Moda’s Thimbleblossoms fame and Carrie of Miss Rosie’s Quilt Company have posted a… well, “challenge” doesn’t seem right, but “suggestion” isn’t strong enough. 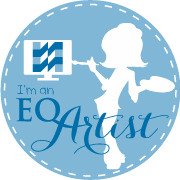 They’re creating a Parade of Quilts, in which bloggers participate by posting and blogging about their first quilt and their most recently completed project, along with something they learned along the way. 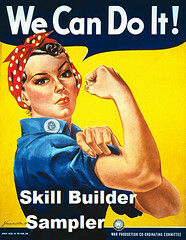 If you’d like to participate, check out their blogs, Simplify and La Vie En Rose. You’ll need to post a link in each of their comments. Do it quickly though – the deadline is Monday! If I knew then what I know now, this quilt would have been made VERY differently. I cut out every triangle separately, cutting squares and then half squares and quarter squares. I matched and sewed each little piece, trying desperately to get my 1/4″ seams to actually be 1/4″. I sewed the geese into long columns and taped the columns to the wall behind me. 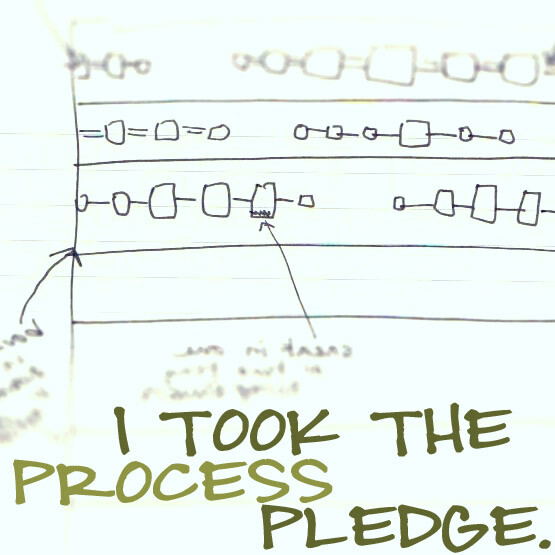 At the time I was working at the dining room table – long before I had my own sewing space. The columns of geese were not straight. They looked like the geese were trying to pull a U-ey, curving gently to the right. The plain strips between the geese helped un-curve them, but I know a number of points got chopped. 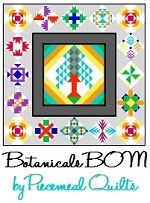 I used a variety of fabrics – I think there were 27 different fabrics, some quilt shop, some JoAnne’s. The quilting itself is less than stellar. It’s just a few long straight lines, because I was scared of messing it up. This was before the Little Gracie II came along, so I did it on my regular sewing machine. The binding is made up of smaller bits of the different sky fabrics. Despite the errors, I really love this quilt. It took a long time to finish, but that was mostly because my usual procrastination kicked it when it came time to quilt it. It was supposed to be for their 67th anniversary, which was in June, but was given to them in October on what would have been my father’s 60th birthday. My most recently finished quilt is a mini quilt I made for a swap and I forgot to take a picture of it! It’s called Shoooooofly, and it was made for the Swap Til You Drop (STUD!!) May Twisted Traditional swap. However, another quilt is almost finished, and I’m hoping it will be done by the Monday deadline. It’s a collaborative quilt with my Mom, and she’s finishing the back and putting it on the frame (probably) today. 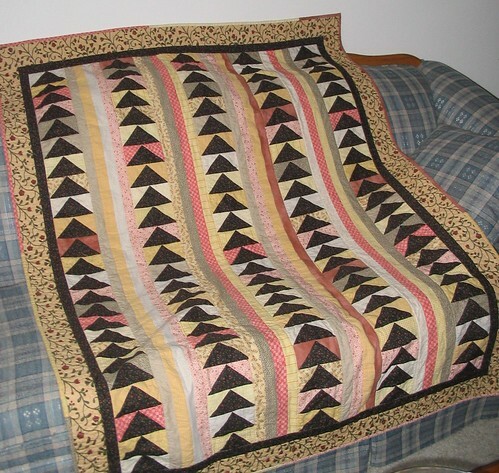 It’s the Good & Plenty quilt for the neighbor girl who just graduated from high school. 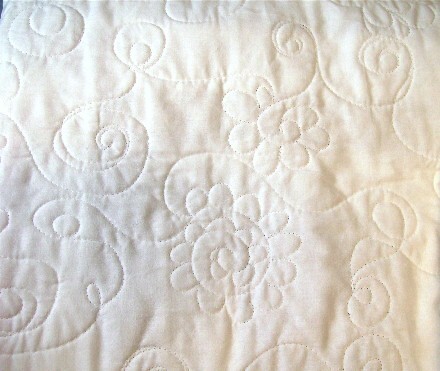 Quilting – I’m really proud of how this turned out! What have I learned in the last five years? Let’s see, I’ve learned that mistakes can be corrected, or at least camouflaged. I’ve learned three new ways to make flying geese. I’ve learned that quilts should be used, not just displayed. I’ve learned that I’m a terrible procrastinator. (Okay, that isn’t new information!) I’ve learned that I get bored easily and want to move on to new projects before the old one are finished. And I’ve learned that the creative process is good for my mental health. 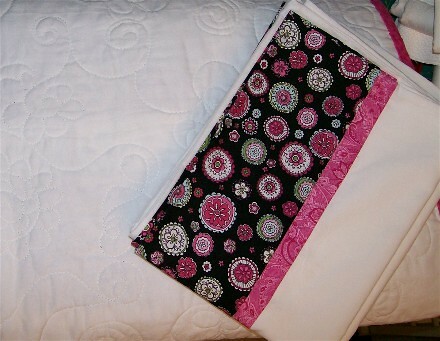 Hi Sandi ~ You had to know I would LOVE your first quilt! I’m a sucker for a flying goose, however wonky, funky and imperfect! And I love the story behind it too. And the label! 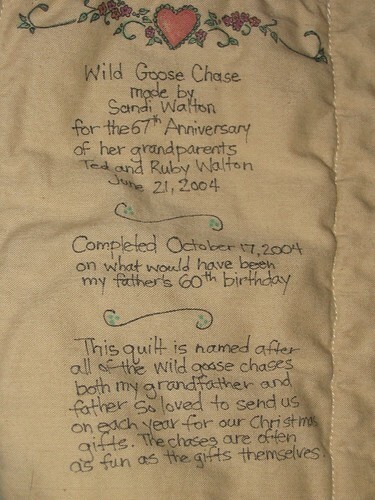 You’re a girl after my own heart with that too ~ every quilt needs a label to tell it’s story! As for what you’ve learned ~ that’s perfectly stated! Ditto! What Sandi said! 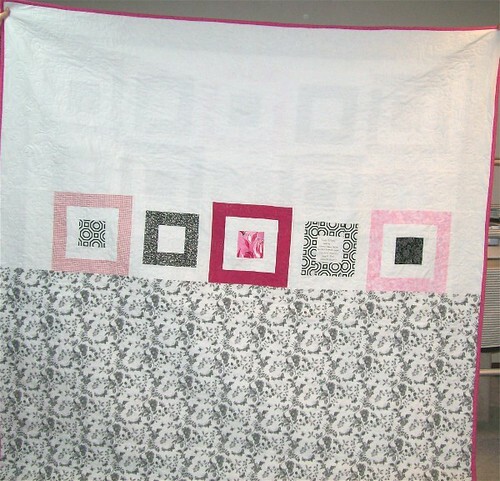 This was your FIRST quilt?! 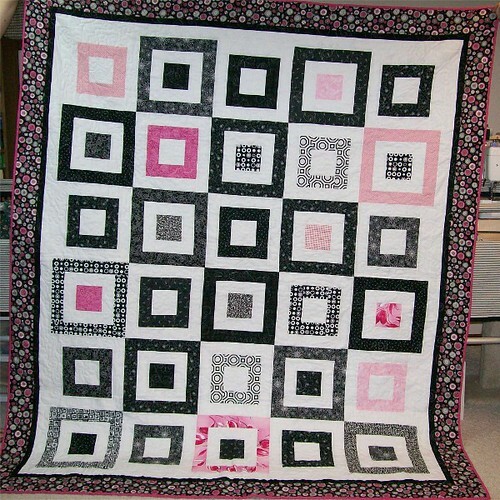 I would consider myself an intermediate quilter and I am just now feeling like I could tackle something like this! You would never know from the picture the pains you went through! Impressive! Arent’ Camille and Carrie so creative to come up with such a fun “challenge” ? I love the quilt. I have the book and the companion quilting book that goes with it. A really beautiful first quilt. Actually, just a beautiful quilt, but that first quilt really holds a special place in our hearts. And a 67th anniversary! Wow. That is really amazing and quite wonderful. That was such a lovely story and beautiful quilt to match. What a beautiful quilt! Your grandparents must have loved it. Such a sweet label too. You’ve inspired me to get started on some labeling! Lovely first quilt, and the label is adorable! Congratulations! Love your quilt. If I had to choose, I love the red and aqua set the most…..two of my rooms in my home are aqua! Thanks for a chance to win such pretty fabrics! I love your quilts! The back of the Good and Plenty is fantastic. You crack me up! The tale of your U-turn geese reminds me of my first quilt–a very sadly hand pieced pinwheel pattern that had many many points chopped off. Someone should warn first timers to avoid triangles. 😉 Your quilts are both gorgeous! My favorite is the back of the Good and Plenty quilt, how neat!! Love the colors, too. I love both of your quilts. The matching pillowcases are sweet and so is your sweet label for your grandparents! This is so fun!